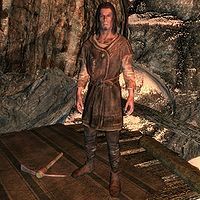 Jesper is a Nord miner who works at Rockwallow Mine in Stonehills under the direction of Gestur Rockbreaker. Like the rest of the miners in Stonehills, Jesper's purpose in life is hard work. He sleeps in the neighboring campsite every night between 10pm and 7am then heads directly into Rockwallow Mine where he works until 6pm. He then enjoys a two-hour breakfast with his colleagues and spends the rest of his evening chopping wood at the wood chopping block in the camp. He wears a belted tunic and a pair of boots. He is equipped with an iron dagger, and carries a key to the non-existent longhouse, as well as a selection of common items and gold. He doesn't have a lot of confidence. Jesper will quickly express that his only current interest is to work at the mine: "I'm just trying to make a living. I've no interest in trouble." He is not very interested in talking with you, as he will tell you, "My business is my own. Why can't others see that?" He seems to be content with his life at Rockwallow Mine, as he will say, "The mine gives us purpose. Something many of us have wished for." Jesper carries the key to a non-existent longhouse, obviously skipped in favor of the exterior camp. This page was last modified on 11 June 2014, at 04:21.